In a small saucepan, add the ingredients for sauce and bring it to a boil over high heat. Once boiling, reduce the heat to low and simmer till the sauce is thicker and glossy. Reserve 1⁄3 of the sauce in a small bowl for final coating. Cut the leek into 1inch pieces and cut the chicken into 1-inch cubes. Alternate each chicken slice with a piece of leek lined up in the skewer. 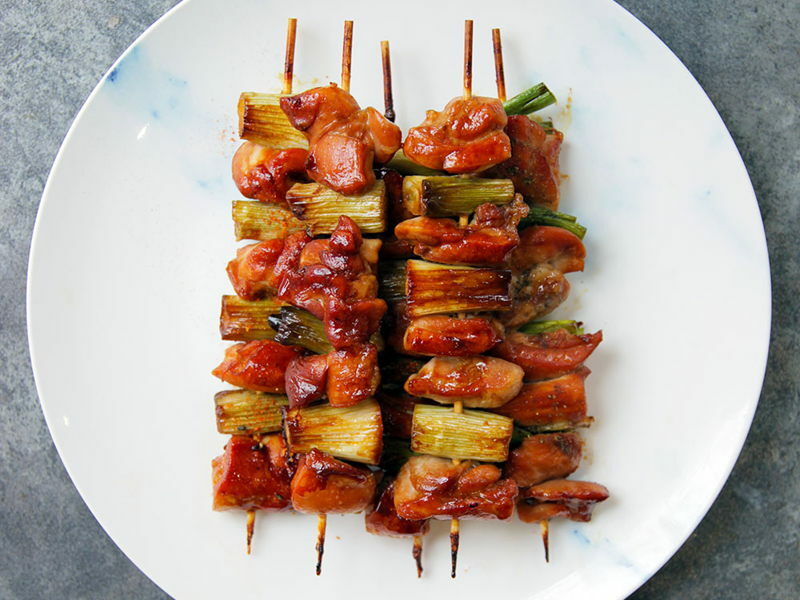 Each skewer should hold about 4 chicken slices and 3 leek pieces. Grease the grate of the grill rack to avoid the chicken sticking on the grate. Place the skewers on top. Set the broiler to high and wait until the heating elements are hot. Broil for 6 minutes. After 6 minutes, brush the sauce on the meat on both sides and continue to broil for 3-4 minutes to caramelize the sauce. Transfer the skewers to a serving plate and brush the chicken on top with the reserved sauce (with a clean brush). Sprinkle sansho and shichimi spices.